For now, employees of Aeroflot are forced to tie down rowdy passengers with blankets. 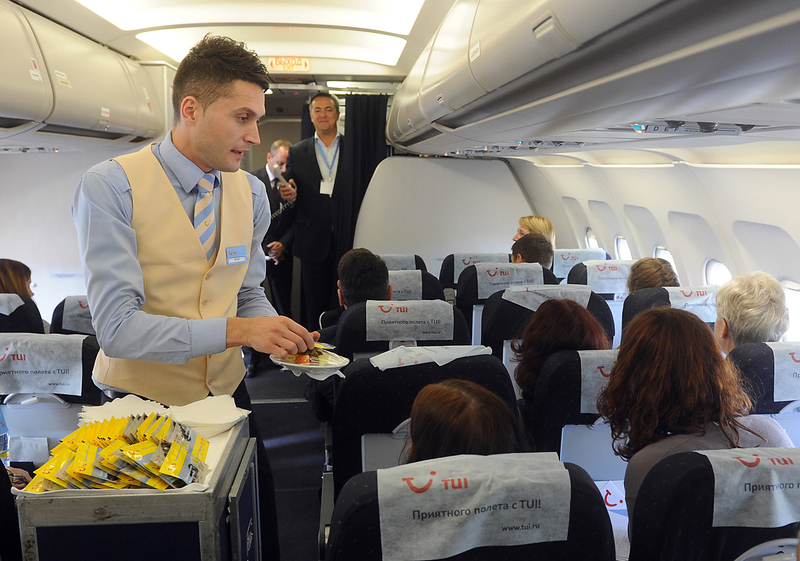 Photo: A flight attendant and passengers aboard an aircraft operated by TUI Airlines. During a meeting on Sept. 29, Putin endorsed the proposal for legal action against disruptive air travelers. Russian airlines also are seeking more authority to block known troublemakers from flights. Disruptive travelers can now face legal action when flying with Russian airlines, including being fined up to 500,000 rubles ($7,935) for public disorderliness on board a plane. Vitali Savelyev, head of Russia’s largest air carrier Aeroflot, made the proposal during a meeting with Russian President Vladimir Putin on September 29, reports the news agency TASS. Expressing his endorsement of the proposal, the president said "It is already high time we were doing this." Savelyev asked for airlines to be given the right to bar 'blacklisted' troublesome passengers from boarding. Currently, crews are only informed about people on the list before boarding, which has grown to over 3,000 people, but cannot prevent them from flying, Savelyev said. He also admitted that flight crews cannot stop these disruptive passengers once they’re on board. "People have become more and more violent, and they are only threatened with administrative liability, which isn’t much," he added. For now, employees of Aeroflot are forced to tie down rowdy passengers with blankets, Savelyev explained, whereas European and U.S. lawmakers are considering introducing not only huge fines but prison sentences of up to 20 years for violent passengers. "We are proposing to transfer company responsibility over to the law on this matter, increasing the fine up to 500,000 rubles – though in some European countries the fine can be up to 100,000 euros," he said. Savelyev also proposed introducing measures "like all European air carriers already have: means of detaining passengers, such as plastic handcuffs and straightjackets."